What is SlimCentials Raspberry Ketones+? Here is a review for a product called SlimCentials Raspberry Ketones+. According to the manufacturer, this product is derived from the original Rasberri-K which they suggest is the authentic material used in weight-loss conducted by Dr. Tim Ziegenfuss at The Wadsworth Medical Center in Ohio. We were unable to verify this fact, however. They suggest that this product will burn fat, shrink fat cells, increase norepinephrine induced thermogenesis and suppress fat absorption and weight gain. They provide several key studies to back up their claims. Their studies, however, are not genuine clinically proven studies, which would be what we look for. That said, this manufacturer has invested a lot of effort into their website and product, which we felt it warranted further investigation. Read on to find out more. When we looked at their website, the ingredient details they listed were incorrect. Their website shows a label for African mango. So we looked to Amazon for more information. Razberi-K 99% Raspberry Ketones (aromatic compound of Red Raspberry), 375 mg Full-Spectrum Raspberry (Rubus idaeus) Powder, Capsule (collagen-enriched gelatin), Silica (natural mineral source). DOES NOT CONTAIN: Magnesium stearate, microcrystalline cellulose, soy, gluten, nuts, dairy or fish. They suggest taking 1-2 capsules before your two largest meals. On days that you exercise, take 30 minutes before you exercise. For even faster results, they suggest combining it with SlimCentials WellTrim iG African Mango and SVETOL Green Coffee Bean. Such extra purchases would increase the costs for consumers, which is unfair. With a quality product, there should be no supplementing it to get great results. 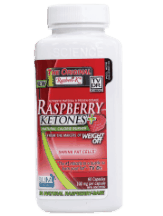 The current price for SlimCentials Raspberry Ketones+ is $24.95. It also comes with free shipping. If you decide to autoship this product, you will save $3.00. We do not like the option to use autoship, we prefer consumers have the freedom of choice when they would like their credit cards charged, or if they would like to cancel their order. However, for some people, this seems to work well. Since this product does not contain any potent, medicinal ingredients it is deemed very safe to use. As with all supplements, if you are concerned, you should speak to your doctor first before taking this product. There is no specific warning label but you should always exercise caution before taking any type of new supplement. If you are pregnant, nursing, taking a prescription medication, or have an existing condition, check with your doctor and of course, if you have an adverse reaction, immediately discontinue your use. While the manufacturer has many claims about the benefits for weight loss, we could not find any detailed information about a manufacturer’s guarantee. If you were interested in purchasing this product, you would have to contact the company and inquire if they do have any sort of money back guarantee or return policy. There are currently no reviews for this product on their website or on their store on Amazon. Therefore, we have found it quite difficult to determine if this product is effective or not. This is a shame, as testimonials give us a good idea if a product is worth trying. SlimCentials Raspberry Ketones+ looks like a great product on initial glance, especially when you take a look at their website. This manufacturer appears to have a history of success suggesting that they were one of the first manufacturers to supply raspberry ketones. So, that said, we thought that we would find hundreds of positive testimonials from happy customers – we found none! This is unexpected and quite frankly odd. We cant explain it. That aside, the ingredients it does contain are good quality and we liked that fact they have excluded many unnecessary ingredients such as soy, gluten, nuts, dairy or fish. However, while the ingredients may be of quality, the lack of information about any type of guarantee and their auto ship program, is alarming. This should be a big deterrent for new customers who want to purchase a quality product without risk of losing money if this product does not work for you. Ideally, a product should have a clear money back guarantee and also strong customer testimonials to back it up, to allow consumers to buy with ease. Without these, this product is trailing in our recommendation stakes. There are so many quality products available that shine brighter than this option, that the manufacturer would have to make some serious updates to be taken more seriously.